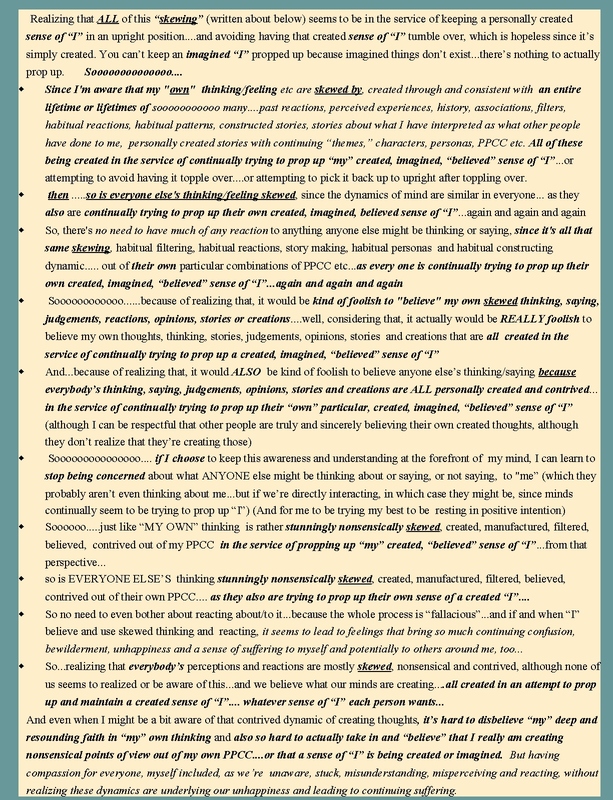 NOT concerning myself with what others might be thinking…. Oh my goodness…………WE’RE ALL STUCK! 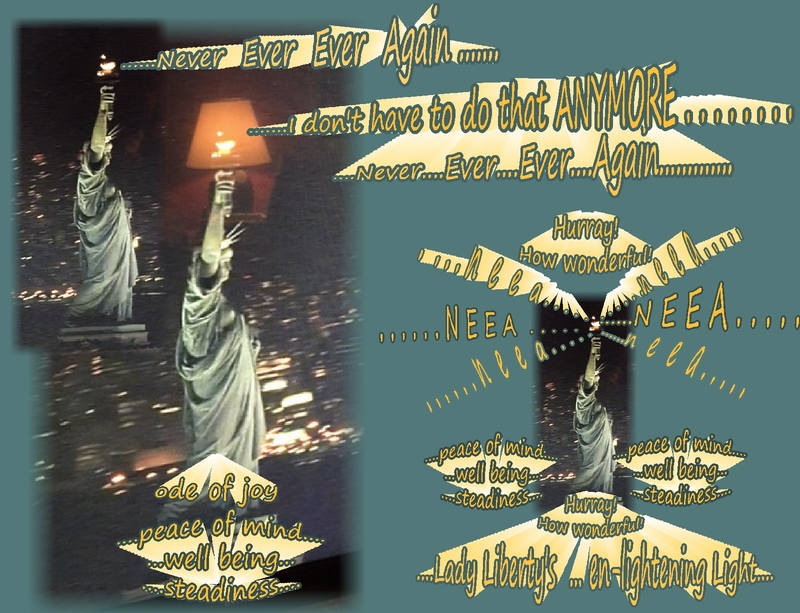 “I don’t need to do that anymore…never, ever, ever again! 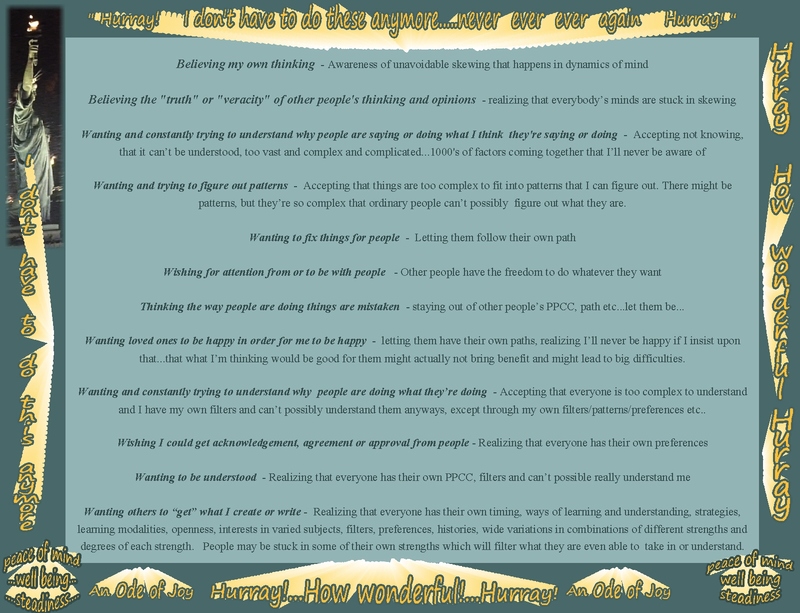 Coming out of these awarenesses, reasonings and realizations…. There’s the potential for freedom from being “stuck” in believing my own personally “skewed” thoughts …freedom from constantly creating habitual, imagined, worrisome thoughts…those thoughts aren’t and weren’t “true” and they’ve led to so much unhappiness in myself and others….. 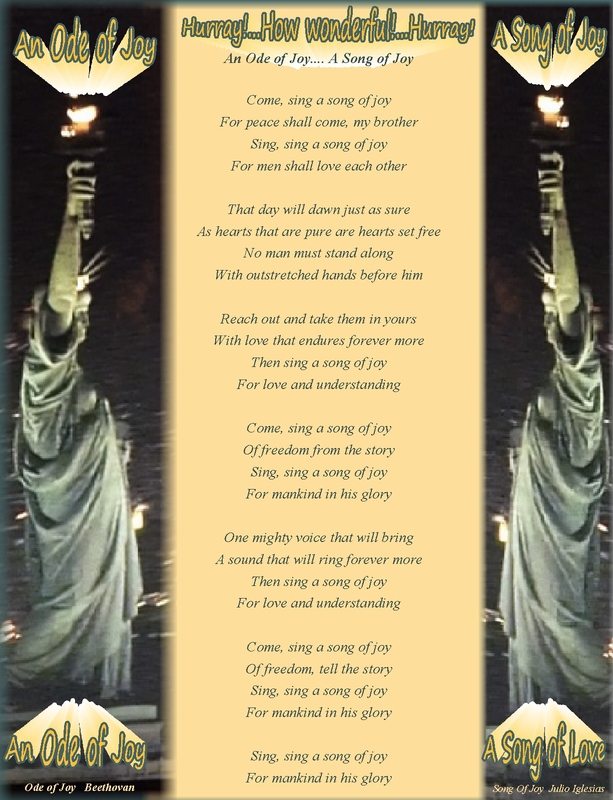 Listening to Beethoven’s beautiful, powerful symphonic music…. Vaguely recalling more contemporary song lyrics to that music.. I had been learning about, noticing, observing and realizing this “skewing” of my own thinking for several months…that awareness was a huge shock and more than a bit disconcerting!..but I was starting to get used to that awareness, in some everyday interactions. 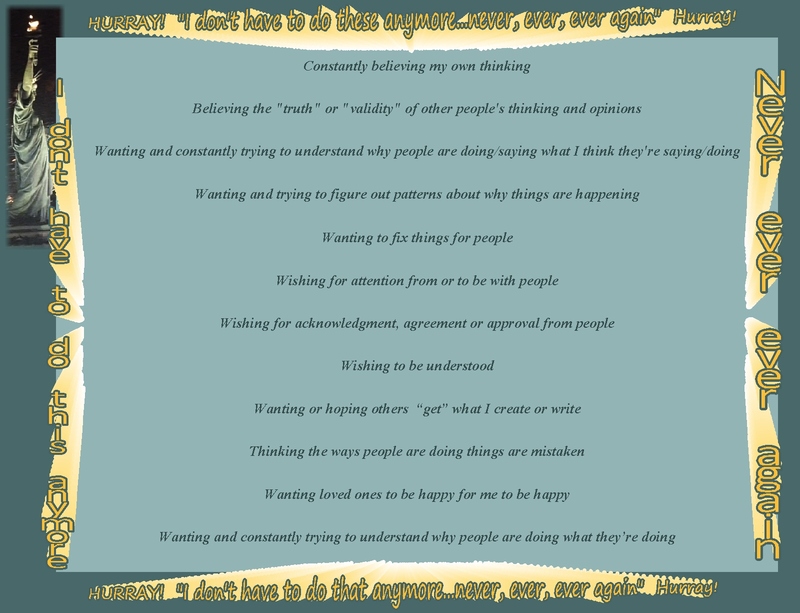 But in situations of reacting to what I didn’t like or didn’t want…still a BIG surprise that my thinking might be skewed! And sometimes… when right in the midst of more deeply felt reactions…I can’t even begin to take in that I might have “skewed” thoughts, perspectives or reactions…I can’t even begin to “see” that…but slowly I’m starting to be able to at least think that might possibly be occurring…an occasional, tiny, tiny little glimpse. 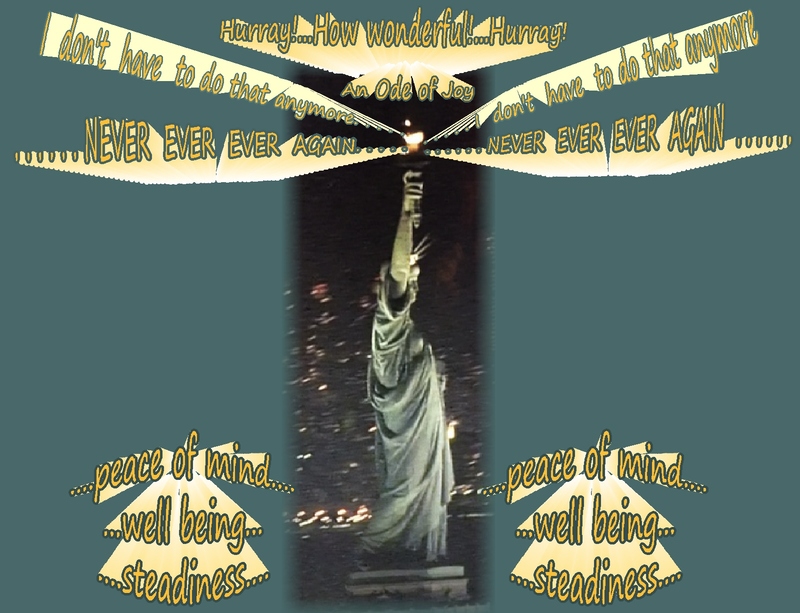 A few nights ago, I was silently repeating that “mantra” …. “I don’t have to do that anymore…never, ever, ever again!” as I was sitting on the couch semi-watching an amazing, basketball game…. the incredible Golden State Warriors basketball team playing at Madison Square Garden. Suddenly, there on the tv screen was an amazing night time photo of the strong, powerful, beautiful, inspiring Statue of Liberty…Lady Liberty…standing so tall, strong, powerful and erect, holding that amazing beacon….a beacon of light encouraging independence, liberty, freedom…freedom from feeling “bound” …freedom from feeling “STUCK” …freedom to choose…freedom to live with more contentment, happiness and joy! 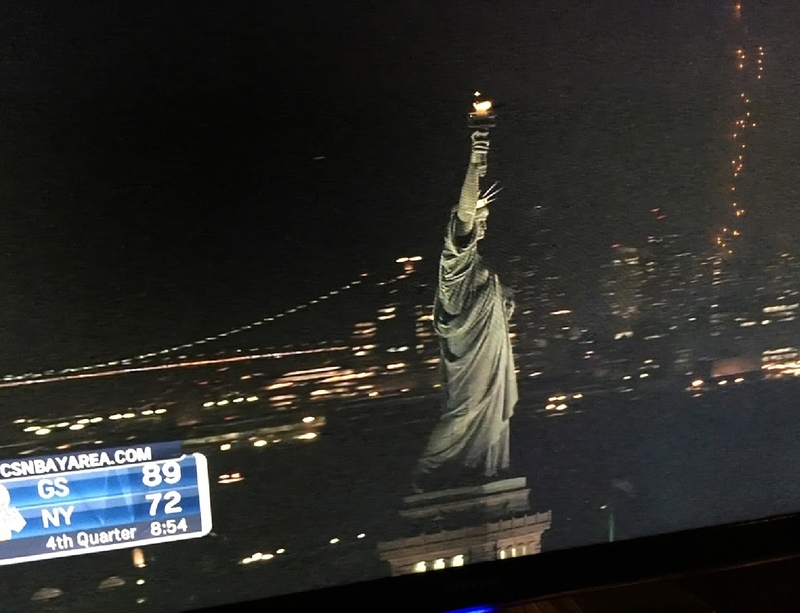 I quickly took a few photos of Lady Liberty on the tv screen. 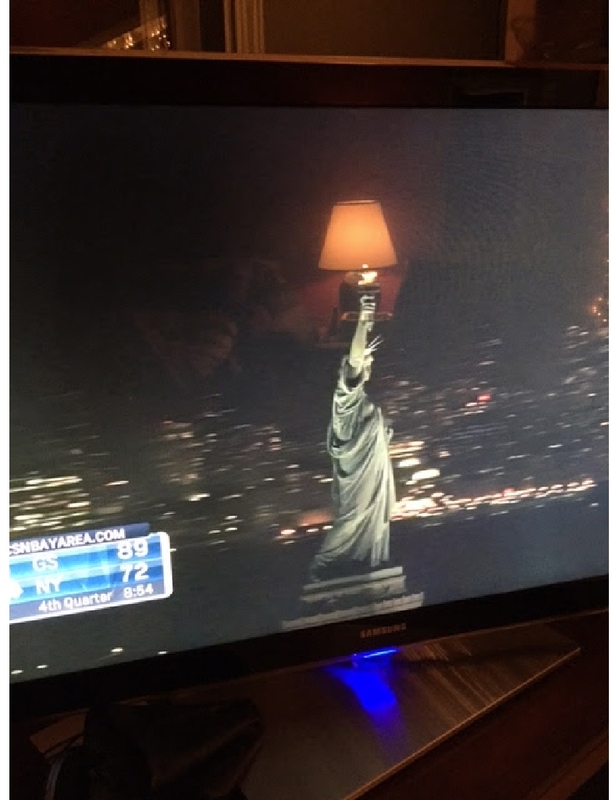 One photo, surprisingly, had a reflection of our lampshade over Lady Liberty’s beacon of light…superimposing my own light over her own light…an inspiration of strength, courage, persistence, freedom and possibilities! I was connecting the reasoning ideas, the mantra “I don’t have to do that anymore! 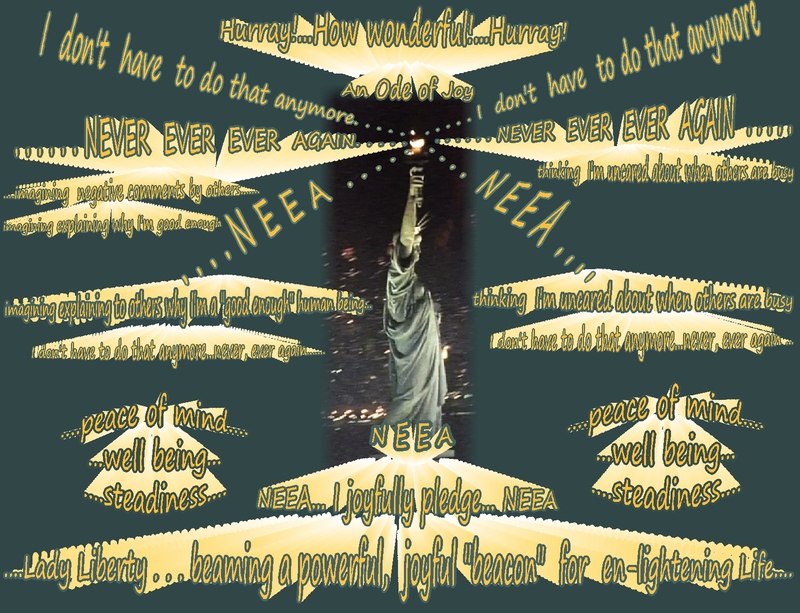 Never, ever, ever again!” and the powerful image of Lady Liberty…realizing that blending these images, words and ideas might lead to far more “freedom” …nurturing and encouraging my own freedom to choose…my own freedom from feeling “stuck!”…my own freedom to live with more a steady and stable sense of contentment, happiness, love and joy…..
What a powerful dream….what a “parable” of emerging from the very deep sleep of anesthesia and from a dream during natural deep sleep…awakening to An Ode of Joy….the freedom to feel more joy, more love, more happiness…supported by letting go of believing my thinking. 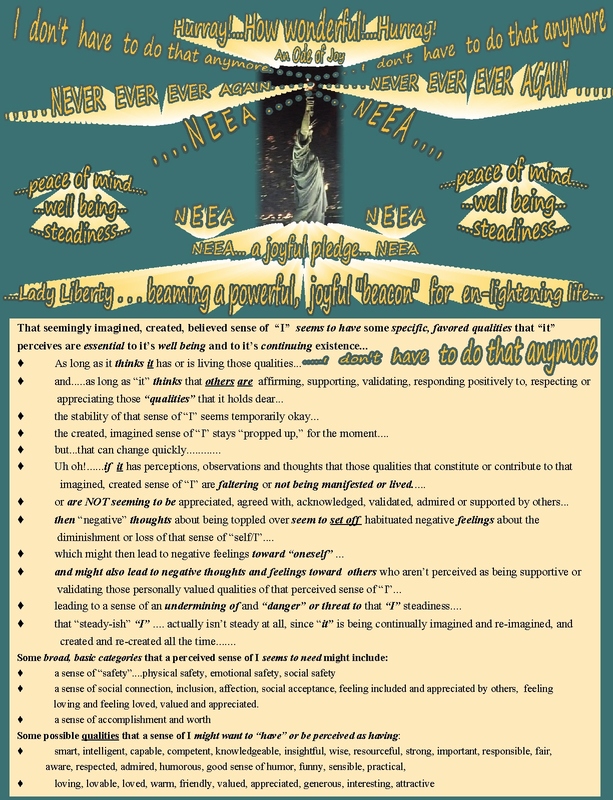 And so………….that seems to be “how” the understandings, images, music, ideas and words on these pages “emerged” from the combining and blending of the awarenesses; the mantra “I don’t have to do that anymore! 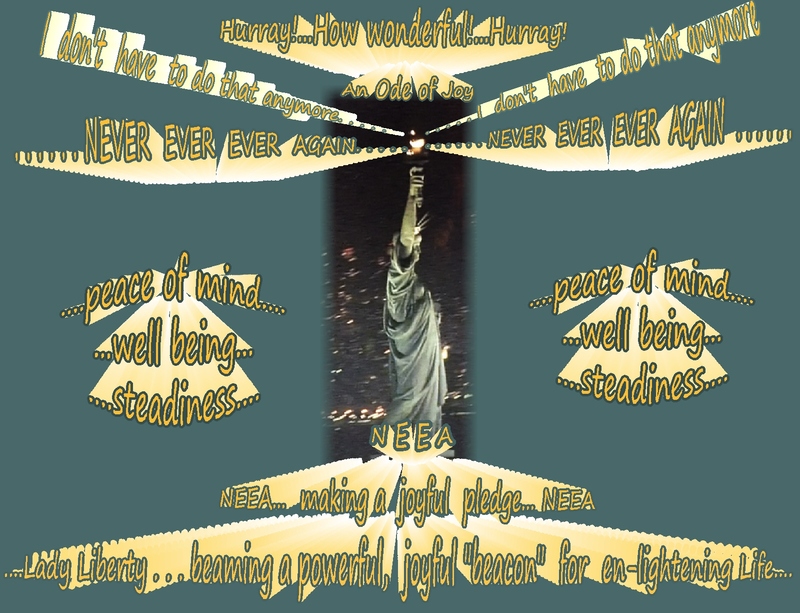 Never, ever, ever again!”; Lady Liberty’s powerful strength and guiding, beckoning Beacon Light; and the Ode to Joy.…………….Wow! 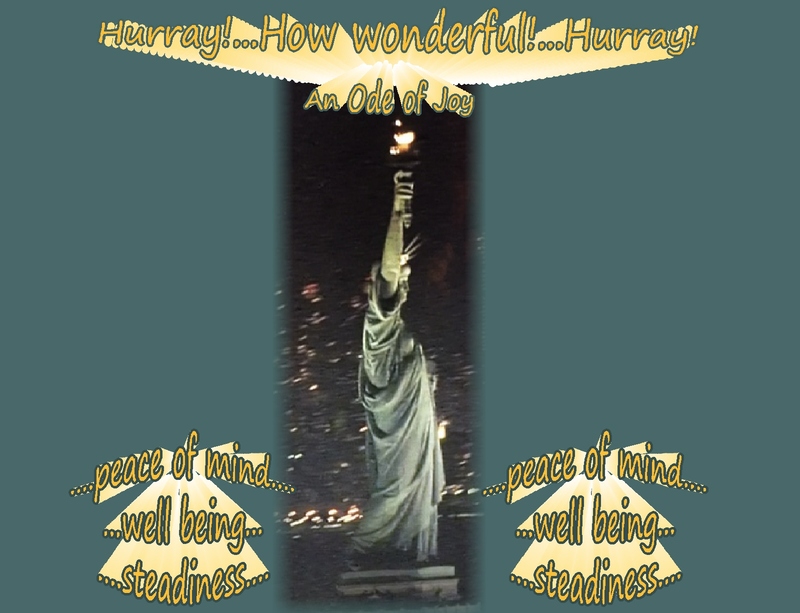 What a gifts I received!….